Make all course materials available electronically, where appropriate, which will allow students to modify into alternative formats that may be more suitable for their needs. Ensure your handouts and notes (or a summary) are made available online 48 hours before the class to give students the time to process the information and to prepare. Content capture is a phrase used to describe the creation of video or audio teaching resources. Panopto is a video sharing system that allows academic staff to capture content in a simple and reliable way, using either an automated system or a manual recorder held on the academic’s laptop or desktop PC. Previously recording lectures would involve filming the screen and presenter with a camcorder which is time-consuming and requires special equipment and often resulted in poor quality videos. Content capture enhances instructional activities; it works especially well in subject areas where students benefit from repeated viewing of content, especially when complex items are being discussed. Access the Academic Support, Technology & Innovation pages for more advice on using technology to enhance and support the students’ learning experience. There is a course available on the DLE 'Creating accessible content'. 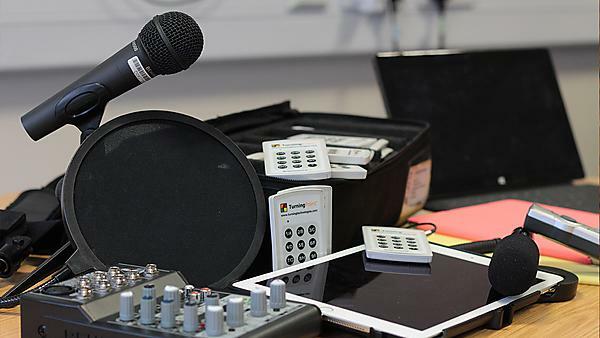 A guide to how technology can assist staff to support disabled students (Jisc). Many apps are available to support learners with SpLD. The ‘Wheel of Apps’. The Diversity and Ability webpages contain a wealth of information about how technology can support students. Diversity and ability have produced a guide for the University of Plymouth on using apps to support students. Listen N Write is free software that can be used to transcribe audio files. For more information, tips and advice on inclusivity in teaching and learning, check our page on interactive teaching, building relationships, improving communication and more. change the background, styles and fonts of documents. use the timeline facility to organise projects/essays. import your presentation slides, so you can organise your audio and text alongside each other.